TWO anti-illegal drugs operations in Dumaguete City, the provincial capital of Negros Oriental, yielded more than P1.25 million worth of suspected “shabu” (methamphetamine hydrochloride). On early Monday morning, 115 grams of alleged shabu placed in 179 sachets, and worth more or less P782,000 were recovered inside the Bureau of Jail Management and Penology (BJMP) facility in Barangay Bajumpandan, Dumaguete City. Also recovered were cash believed to be from drug sales amounting to P210,000, a digital weighing scale, six cellphones, and other illegal drug paraphernalia. These items were recovered in the kitchen, buried under the “dapog” or makeshift stove. Senior Inspector Vann Tingson, City Drug Enforcement Unit chief, and his team received reports that the contraband items were buried “ilalom sa dapog nga adunay giinit nga tubig” (underneath the makeshift stove where water was being heated), which is an unlikely place to be searched, even with the sniffing dogs, because of the heat. Chief Inspector Prycel Arevalo, BJMP city warden, said he has requested for this greyhound operation to flush out possible contraband items that might have sneaked in during the holidays when the facility was swarmed with 200 to 300 visitors every day. He also requested the presence of the Philippine Drug Enforcement Agency (PDEA), headed by Agent Grace Cruz, the Dumaguete Coast Guard who brought two drug-sniffing dogs and Criminology students of the Negros Oriental State University, purposely to help in the greyhound operation. 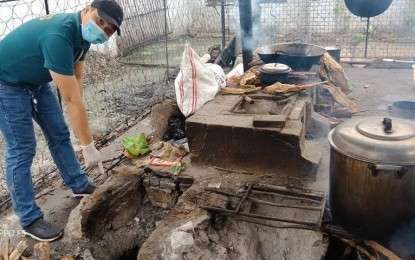 Following the confiscation of the alleged shabu, kitchen personnel at the city jail will be investigated, as well as owners of the cellphones that were seized. There were no SIM cards in said cellphones. According to warden Arevalo, sanctions and disciplinary actions will be imposed against detainees who will be found responsible for keeping the illegal drugs. On Sunday, two drug suspects were arrested by the police in a drug bust at Purok Makiangayon in Barangay Talay. They yielded 33 sachets of shabu weighing more or less 70 grams with an estimated Dangerous Drugs Board value of P476,000.